If you want to know what HMB is, how it works, and whether or not it can help you gain muscle and strength faster, then you want to read this article. Every so often, a sports supplement comes along that gets everyone excited. That’s supposed to “change the game” and push the boundaries of what’s naturally achievable. HMB is one of those supplements. 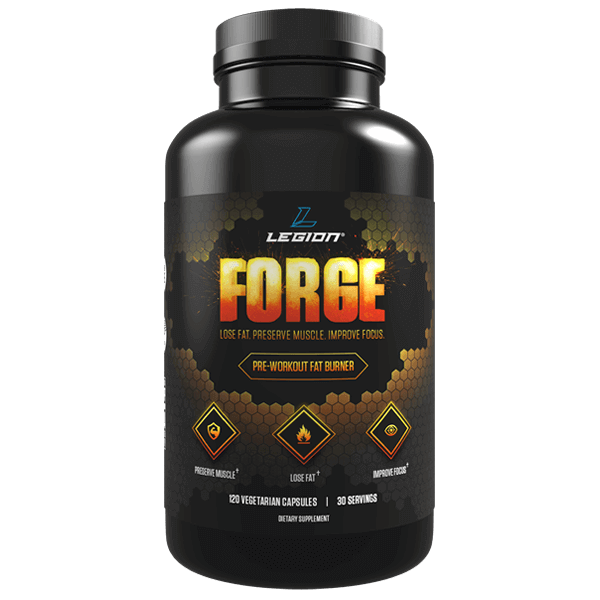 It burst onto the scene in 1996 to much fanfare and hoopla, and many thought it was destined to dethrone creatine as the reigning king of natural muscle building molecules. Well, science has now had a couple of decades to look into it, and, well, it didn’t quite pan out. That said, it does have some legitimate uses for us fitness folk, so it’s not a complete flop. And we’re going to break it all down in this article. By the end, you’re going to know what HMB is, why people supplement with it, how it can benefit you, how much you need to take to see those benefits, what side effects there are, and more. Why Do People Supplement with HMB? Can HMB help you gain muscle faster? Can HMB improve your anaerobic endurance? Can HMB improve your recovery? Can HMB increase your power output? Can HMB reduce muscle breakdown rates? What Is the Clinically Effective Dose of HMB? What Types of Results Should I Expect From HMB? Does HMB Have Any Side Effects? HMB is shorthand for beta-hydroxy beta-methylbutyrate (also shortened to β-Hydroxy β-Methylbutyrate), and it’s a metabolite of the amino acid leucine. A metabolite, by the way, is a metabolic byproduct, a substance that results from the processing of another, and in this case, leucine. The HMB molecule came to light through research conducted on leucine supplementation. Scientists learned that leucine influenced protein synthesis, glucose levels, and muscle recovery, but didn’t know why. A hypothesis was formed that these benefits were being mediated by something produced when the body metabolized leucine. This turned out to be a fruitful line of inquiry, because it lead to the discovery of HMB. The main reasons people supplement with HMB are to boost muscle growth, endurance, recovery, and power output, and decrease muscle breakdown. And if you’re to believe the hype, it can deliver on all of these promises in a big way (just read the sales copy for any HMB or HMB-containing supplement). Out of all the supplements you can take for your muscles, HMB ranks near the top in terms of purported benefits. How well do they stand up to scientific scrutiny, though? Muscles are made of protein, which is why protein synthesis (the creation of proteins) is the fundamental to the physiology of muscle growth. HMB supplementation, we’re told, promotes high levels of protein synthesis in the body, which in turn helps our muscles grow faster. Research casts doubt on these claims, though. One study found that HMB supplementation did increase protein synthesis rates, but it was greatly outperformed by the same dose of its parent molecule, leucine, and other studies have found no such benefits. Thus, when you weigh all of the available evidence, you have to conclude that HMB is not a powerful muscle builder. There are two different types of endurance, aerobic and anaerobic, and the key difference between the two is the presence or absence of oxygen. When you exercise at a relatively low intensity, like walking or lightly jogging, your body can keep up with your muscles’ demand for oxygen. This is aerobic exercise, and it leans on your body’s aerobic system to supply the energy needed. When you exercise at a higher intensity, though like sprinting or lifting weights, your body can’t supply oxygen to your muscles to keep up with demand. This is anaerobic exercise, and it’s powered by your body’s anaerobic system, which can generate energy without oxygen. Now, it’s often claimed that HMB can increase anaerobic endurance (and thus workout performance), but studies contradict these claims. It would appear that it’s no more effective at improving sprint performance than a placebo. The better you can recover from your workouts, the more effective they are in terms of muscle gain, and the more frequently you can train your various muscles groups (allowing for greater muscle growth over time). This is why bodybuilders talk so much about muscle being built outside of the gym. Everything you do to support muscle recovery–eating right, sleeping enough, staying out of the gym, etc.–is what allows muscle growth to occur. Now, as far as HMB goes, it may or may not help with recovery. Only two studies have been done to directly test this hypothesis, and one was positive but the other failed to see any such benefits. We’ll have to see what comes out of further research to make a final judgment here. “Power output” sounds cool and is thrown around a lot in fitness circles, but many people don’t know what it actually means. So let’s take a moment to define our terms. Simply put, power output describes the amount of work being done in a given period of time (and work, in this sense, refers to the application of force to overcome resistance). Think of flexing your biceps, for example. The force generated by the contraction of the muscles must overcome both internal (friction) and external (gravity) resistance to successfully bend your arm. If you were to measure the amount of force that it took to flex your guns, you’d have a measurement of the power output of that movement. Now, you can increase your muscles’ power output by increasing their strength and/or by increasing the amount of time that they can maintain forceful contractions. This is the fundamental goal of resistance training: to increase the power output of your various muscles over time. Well, unfortunately, studies show that HMB can’t help here. Simply put: it doesn’t increase power output. There’s good evidence that HMB does indeed mitigate muscle breakdown, which makes it useful for use with fasted exercise. In short, HMB slows down the rate at which your body breaks proteins down, which allows you to reap the fat loss benefits of fasted exercise while negating the downsides relating to muscle loss. The clinically effective dose of a supplement is the amount that has been proven beneficial in scientific studies. In this case, it tells you how much HMB you need to take in order to markedly reduce muscle breakdown rates: 1 to 3 grams per day. Some people say that you must use the free acid form for anti-catabolic purposes, but they’re missing the forest for the trees. You see, the free acid form is more immediately bioavailable than the calcium salt form, but all that means is your body can “access” the HMB quicker, not that the calcium salt’s HMB molecules are somehow inferior or lost. This doesn’t matter when the HMB is taken before a fasted workout, though, because muscle breakdown rates don’t really begin to ramp up until an hour or so after you’ve finished your workout, giving your body plenty of time to begin processing the HMB in the calcium salt form. Like all natural supplements, don’t pin unrealistically high expectations on HMB. Remember that supplements don’t build great physiques. Dedication to proper training and nutrition does. For most of the claims related to muscle building and power output, the evidence is either inconclusive or just doesn’t hold water. HMB probably can’t help you gain muscle faster, and it may or may not increase your performance in the gym. What is well established, though, is HMB’s ability to decrease muscle damage and loss. That makes it well suited to fasted training, which, when used properly, can accelerate fat loss (and stubborn fat loss, in particular). Yohimbine is a chemical extracted from a species of African plant, Yohimbe, and studies show it can speed up fat loss. This is a chemical that occurs naturally in the brain that increases levels of another chemical called phosphatidylcholine, which is vital for brain function. That’s why research shows that supplementation with CDP-choline improves attentional focus (which is a welcome benefit when you’re training fasted!). The highest dose of a substance you can take/give to an animal before noticing adverse effects is called the No Observed Adverse Effect Level (NOAEL). Well, animal research indicates that HMB’s NOAEL in humans is very high: about 558mg/kg for males and 665mg/kg in females. So we can rest assured that a few grams per day isn’t going to cause any unwanted side effects. HMB is a victim of unrealistic expectations and marketing shenanigans. It was supposed to be the next big thing in muscle supplements, and it just isn’t. What it is, though, is a powerful anti-catabolic agent, which makes it valuable under certain circumstances (like fasted training, for example). What’s your take on HMB? Have anything else to share? Let me know in the comments below!